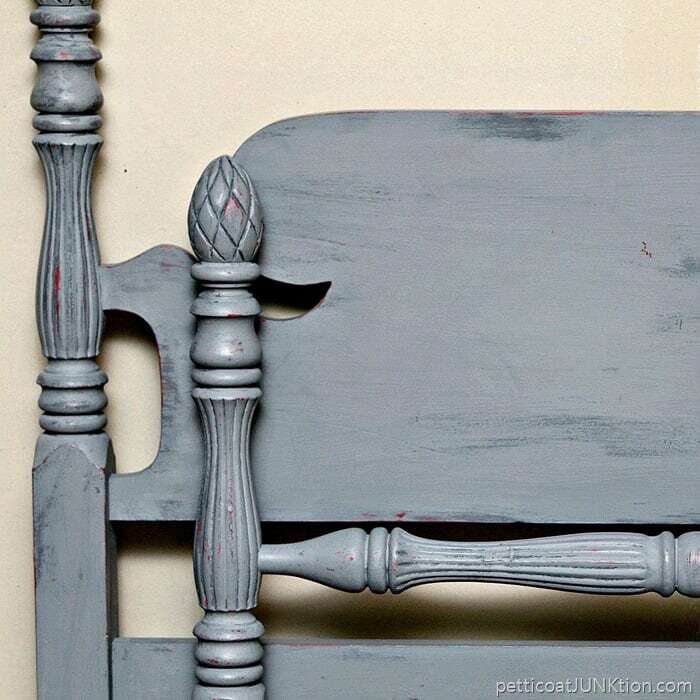 Today’s story is about the gray twin bed and the easy Vaseline petroleum jelly paint layering and distressing technique. Yes, it’s really easy. 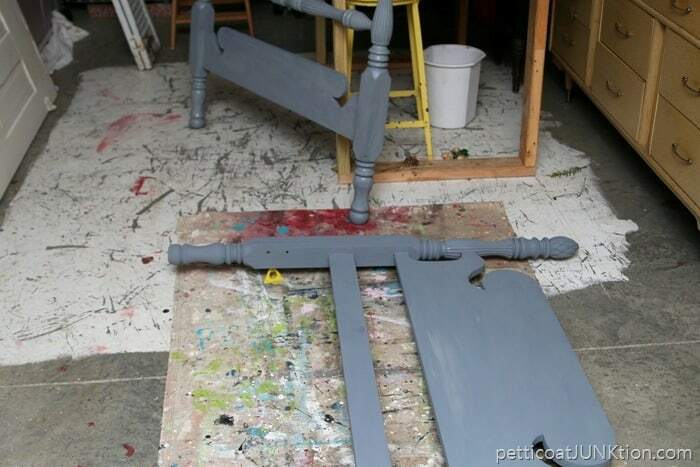 There are three layers of paint on the bed. 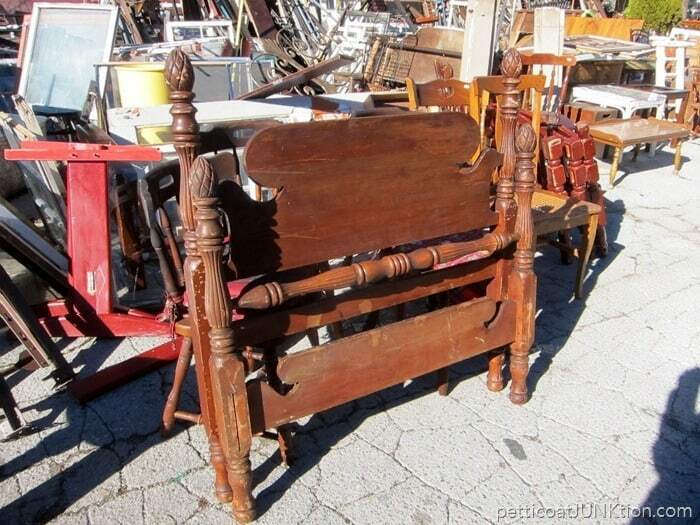 This is the bed I found at my favorite junk shop. 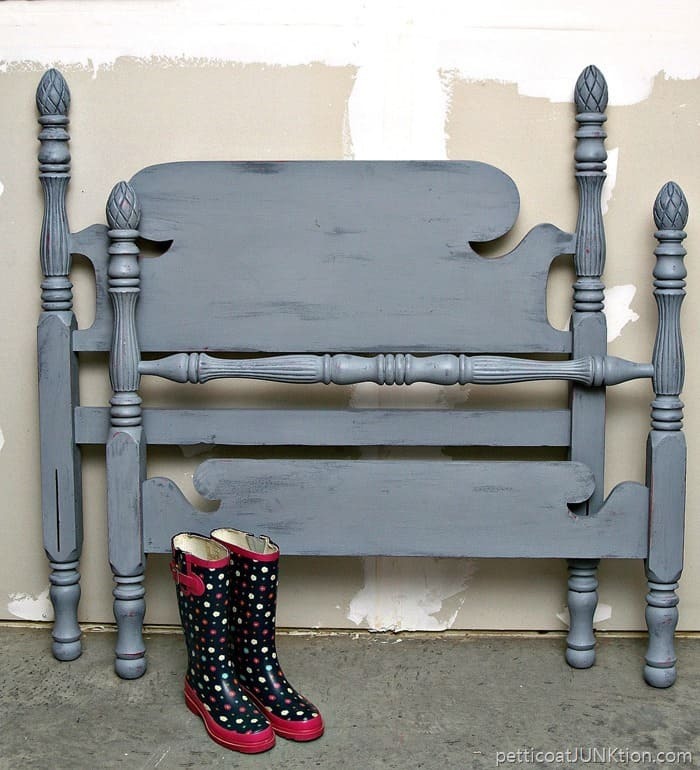 I got the headboard, foot board, and rails for $25. A steal. Now I’m going to go through the paint technique step by step. 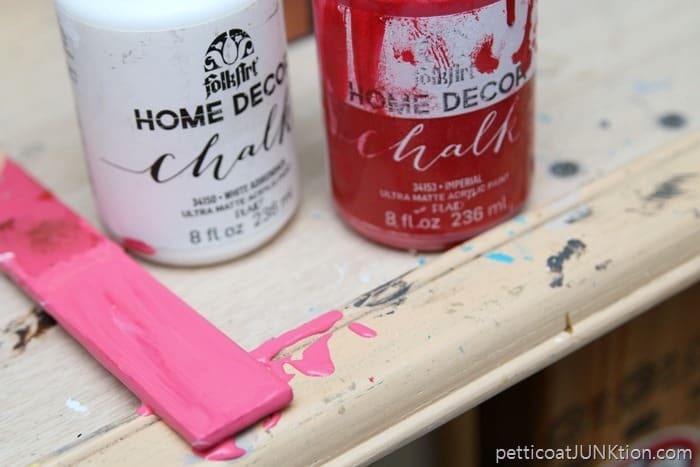 Brush on your first paint color. Doesn’t matter what color it is but you need to have the plan before you start. I didn’t have the perfect pink in my stash so I combined white and imperial red FolkArt Home Décor Chalk. I mixed the colors until I got a pink color that made me happy. 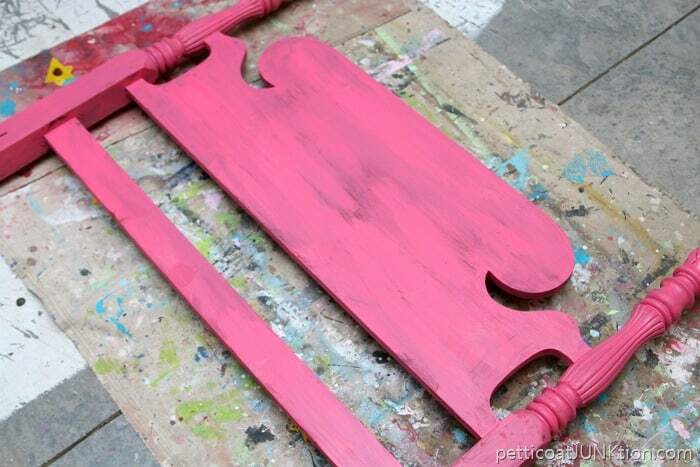 This is how the bed looked after one coat of pink paint. 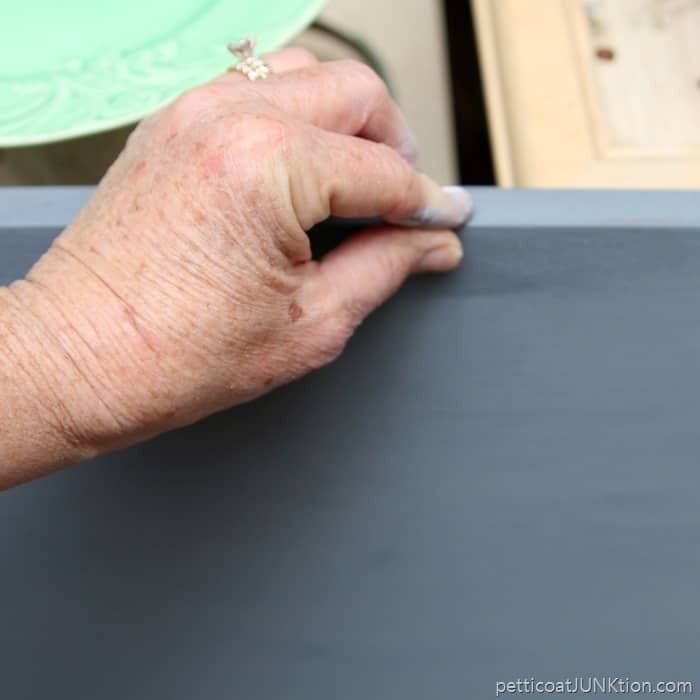 There is no need to cover every square inch of the piece or to make the finish look perfect. There are going to be two more paint colors over this one. Step 2. Apply Vaseline Petroleum Jelly. This is where the project gets a little tricky. Sometimes I have a hard time getting just the right amount of Vaseline between the paint layers. I either use too much Vaseline or not enough. I worked out a solution to the problem this time. Instead of applying the Vaseline with a rag I just used my fingers. It’s easier to tell how much petroleum jelly I’m applying to the furniture. Wipe on a very thin layer in the areas you want to be distressed. Too much Vaseline and the paint gets gunky and you have to wipe it all off and start over. Voice of experience. Step 3. Apply the second paint color. I wanted a soft dreamy look for the bed so I was going for a flat finish. To get the finish and the color I wanted I had to mix the gray too. I mixed together charcoal and wedding cake colors in the Martha Stewart Craft Vintage Décor Paint. Do you have to mix paints for your project? No. I have a large selection of paints on my shelves so I hate to go buy more paints. You can just go to the store and buy the paint color you want or do like me and use what you have on hand. I applied one coat of the gray paint over the pink. You may be able to see the little yellow “pyramids” under the headboard. I love these things (have to look up the name). I painted both sides of the bed in one shot. I laid the bed on the pyramids until the paint dried. Step 4. Apply Vaseline Petroleum Jelly…again. 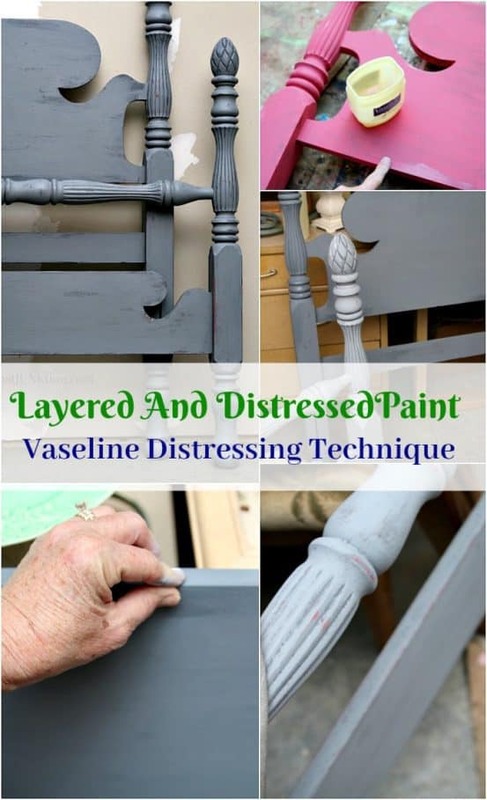 Now we need to repeat step 2 and apply the petroleum jelly where we want the paint to come off when distressed. Step 5. Apply the third paint color. 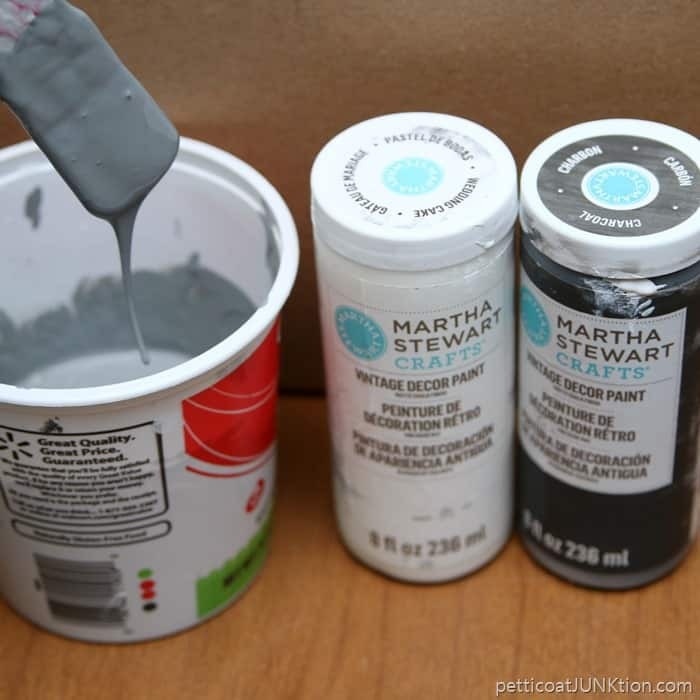 For paint color number three I just added more of the Martha Stewart Wedding Cake color (white) to the gray paint mixture (second paint color) to make a light gray. I brushed on the third paint color. In this photo you can see the difference in the two grays. 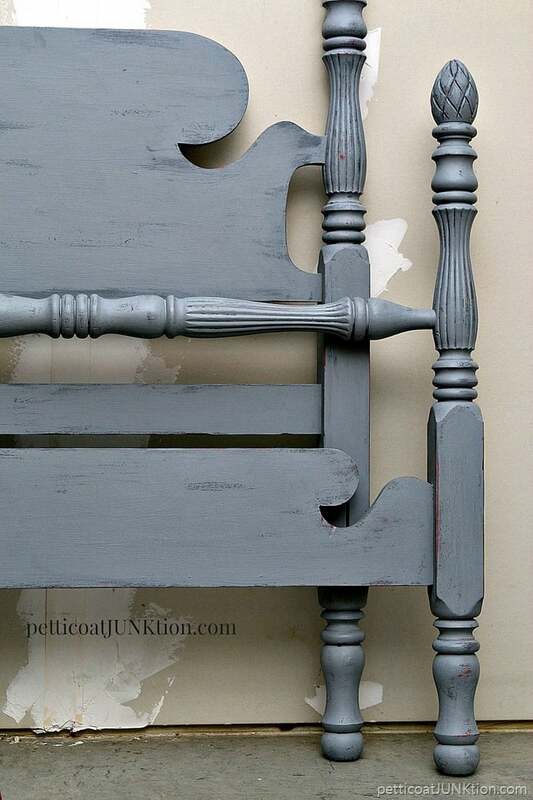 The headboard hasn’t been painted with the light gray yet. 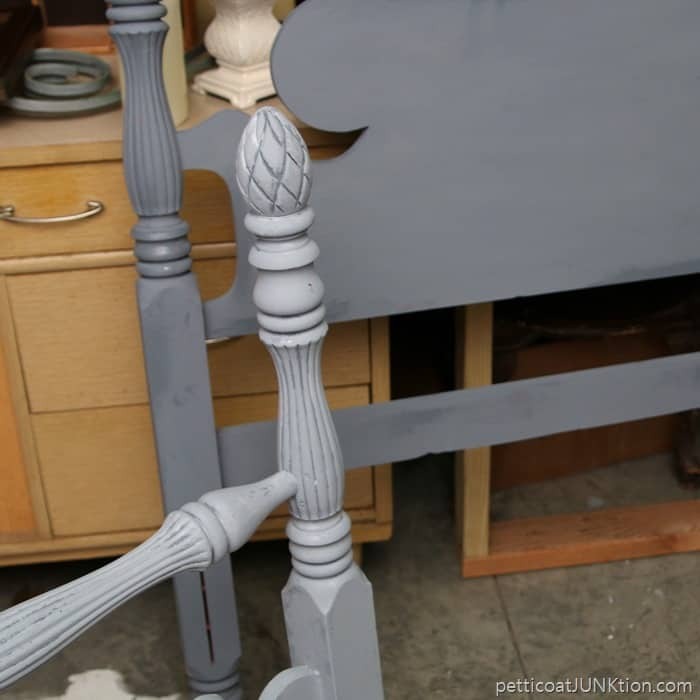 After this step the bed has three layers of paint color with two layers of Vaseline…one coat between the pink and dark gray….one coat between the dark gray and the light gray. Step 6. Distressing the paint. Now we’re ready to distress the paint. Where the Vaseline has been applied the paint will not bond properly and will come off when distressed with sandpaper. I used 100 grit 3M flexible sandpaper and sanded really gently. 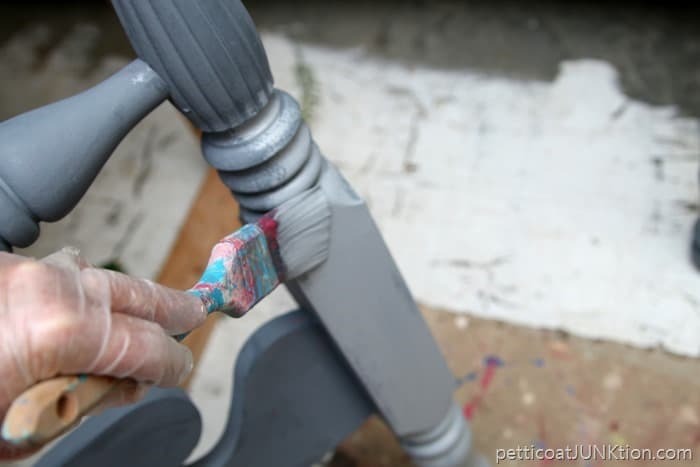 In some areas the paint was removed down to the dark gray and in some to the pink. I tried not to sand the paint down to the original finish but did in a few places. This step is not required. It all depends on the look you’re going for. I used flat paint but wanted it to have just a bit of shine. The photo above shows where I applied the wax to the leg but not the part of the bed on the left side of the photo. 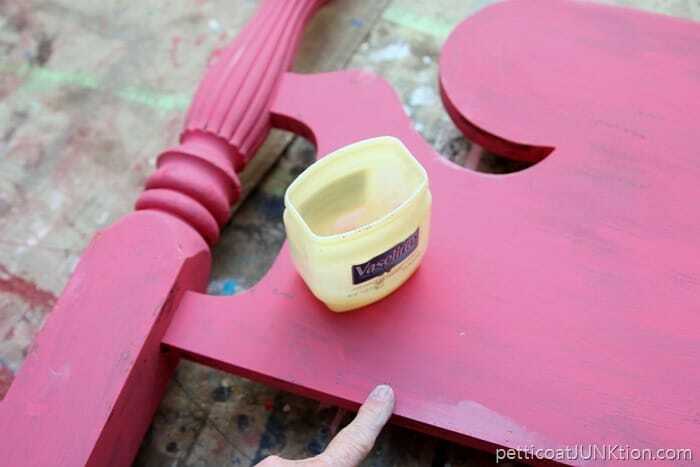 Of course if you use latex paint with a satin finish, etc. you don’t need to apply wax. That’s all there is to it. Several steps but an easy technique. Don’t be afraid to give it a try. Believe me, I make a lot of mistakes in my projects but they are easy to correct because it’s just paint! Hope you guys have a great day and I’ll see you tomorrow…or the next day. I’m new to crafting, but this made me feel I could do it. One time maybe you could explain the different types of paint and why you use them and where. 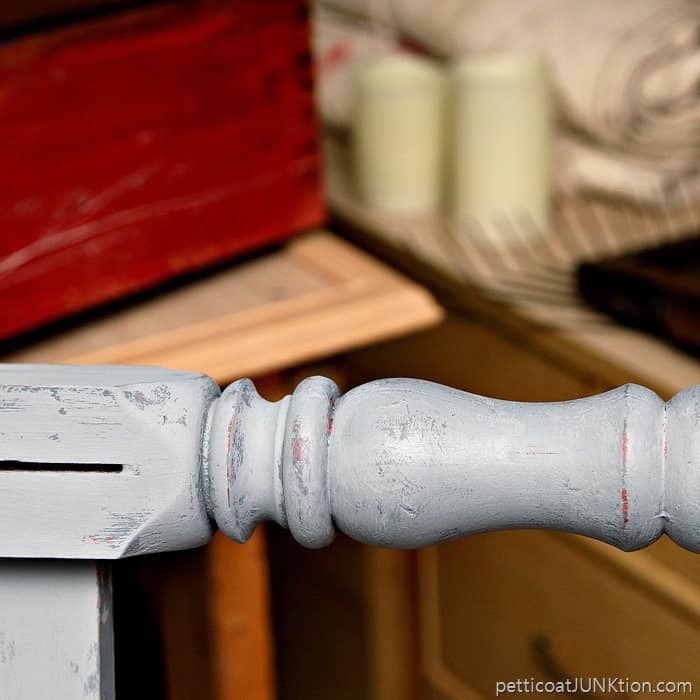 Ex: chalk paint or regular paint or spray paint. Also give a. Approximate amount of paint needed. I see the small jars and find it impossible to complete a project with it. Thanks for clear instructions and helping me to get interested. 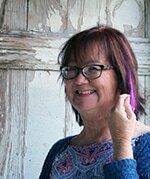 By the way I’m 71. This is just a stunning bed now! Thank you so much for the paint technique explained so well. Am pinning to do exactly this for a soft beige, white, cream on my bed! I am loving this technique!! Kathy, I don’t fully understand the reason for using the Vaseline between coats. 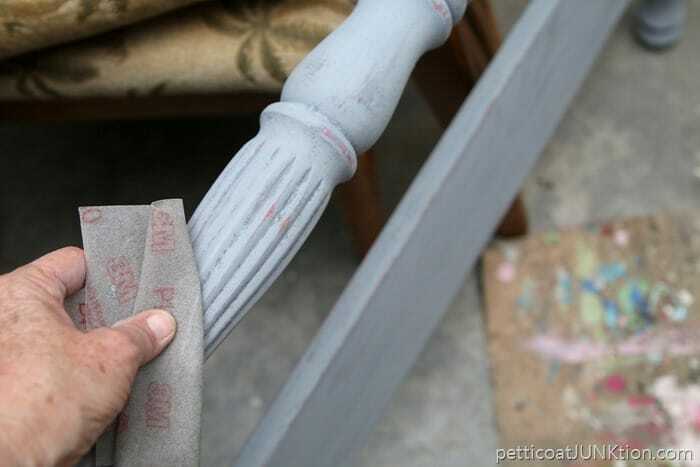 Why is it different than just distressing the three coats with sandpaper when you’ve completed applying them, since you are using sandpaper at the end any way? I do want to say, though, that your instructions for doing this project and method were very clearly written. I appreciate that. It seems that often instructions leave out small steps or results here and there so you aren’t quite sure what your results should look like, or you aren’t clear about the procedure. Yours are crystal clear! Thanks for the post. The bed looks great! LOVE it!! you did a great job. 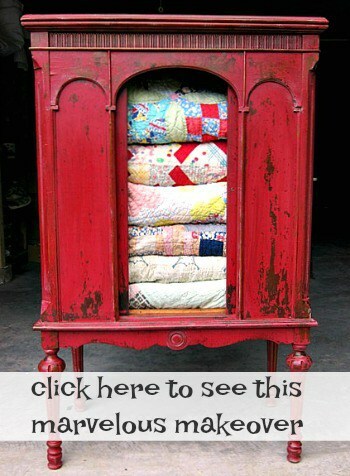 Love this look, and it appears to be relatively easy! Thanks for step by step instructions, plan on trying this technique soon.